Built in 1903 by African American builder A.W. Thorne, this is the second building for the Mt. 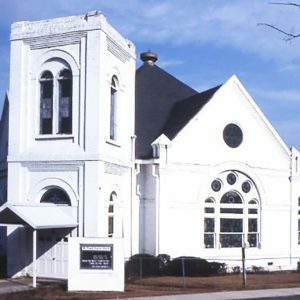 Pisgah Baptist Church congregation, which was organized around the mid-19th century. The brick church features a sophisticated design including a square plan with a prominent tower on the south corner. Other significant features include complex three-part stained glass windows and beaded board wainscoting and ceiling on the interior. Nelson C. Nix, who served as pastor of Mt. Pisgah for 40 years in the early 20th century, was also the dean of the mathematics department at South Carolina State College.